I’ve an old friend, the poet David Weiss. David and I go back a long way–we first met when we were teaching together at Hobart & William Smith Colleges back in the early 1980’s. David was married to the poet and memoirist Deborah Tall who also taught at HWS. Deborah passed away four years ago after a long fight with a virulent form of breast cancer. And now my dear friend has done what poets have often done in the dark seasons: he’s built himself a stone tower. 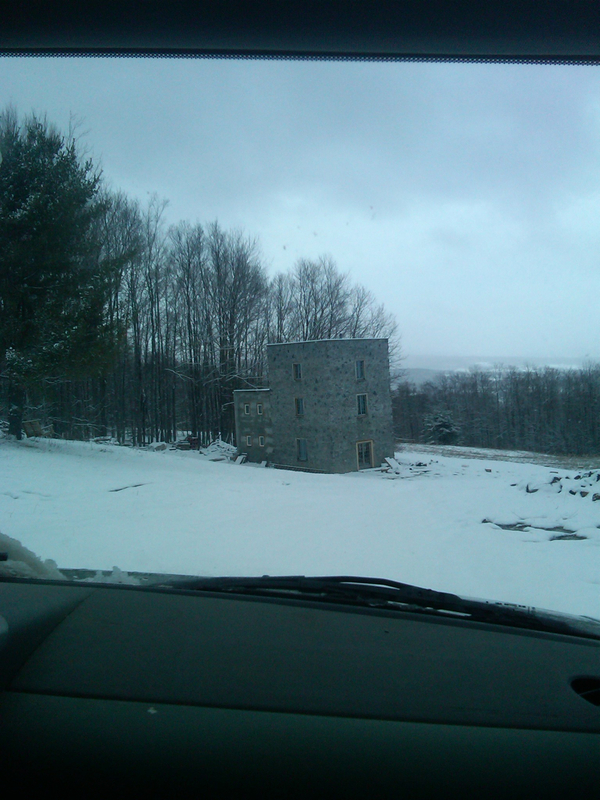 The tower is in the woods outside of Ithaca, New York. The construction has been a labor of extraordinary proportions for David is in his mid fifties and he did an enormous amount of the work himself. He also had the wisdom to hire Amish carpenters who know some truly old world crafts and who also know how to find a good bargain when it comes to quarrying. But Amish help aside, the tower which is now almost complete is a rare and exacting testimony to poetry’s province for this is a room of one’s own–a building that’s so quiet you can hear the ringing of the air behind its foot thick walls. The tower is also currently the home of a white rat who nibbles at David’s produce in the night. I’m urging him to tame the rat for surely it’s proper if you’re a poet in a tower to have a white rat as your guest. We do not know what David’s lovely new wife Bobbi will think of the rat idea. Yeah, what is it with writers and their towers? Your friend’s is spiffy. My two favorites are Vita Sacksville West’s and Robinson Jeffers’. Here’s some towers! Tell your friend to nix that rat — one rat soon becomes more.